When we look at the square, the circle and the triangle we most of the time see that attached to Aikido. Ueshiba Morihei (植芝 盛平)used them to describe parts of his art. Most of the time people look at them in philosophical matter what is great and it is important to understand his idea of Aikido. Let’s look at these geometrical shapes from another angel and think a bit deeper in body mechanics. Please understand also that this article is only about free thoughts and experiences. It should not insult someone or make any discredit to any person. It is also not the only truth about that. 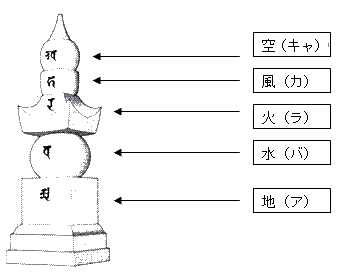 The square, circle and triangle are also the geometrical fundament of Chi 地, Sui 水, Ka 火, Fu 風, Ku 空 what is also symbolized by square, circle, triangle, semicircle and the flame. When you look at this in a body mechanical way, it shows you how martial art should be build up. It is also important that you understand it in a 3 dimensional way. Only when you apply all dimensions it works in the best way. The Square is all about stance, moving and rooting. Not simply moving, it is about moving with the center. Only when you move your center you are able to affect and move the center of the Uke. You have to learn to move your center in conjunction with your techniques. That means that every technique has to come out of your center. Your arms and legs are only the extension of it. This is in my opinion something a student has to learn first. First you learn how to move your center and make your techniques out of your center and then you learn how you can move and affect the center of the Uke by doing so. The circle is all about circular movement. 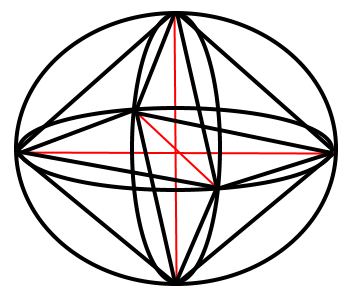 It circles around the center and also here you have to see it in a 3 dimensional way. All your power comes from the center and with the theory of the circle you are able to generate a lot more of it. For example a finger-lock, when you apply 3 circles on it instead of one like most people do, you get much bigger effect. So you can use the circle to generate more power but you can also use it to destroy the center of the Uke. Also here you first learn to generate power to combine it with movement from the square and then you learn how you affect your Uke much more by using that principle to destroy the center of him. Together with the circle you learn to give and take bases by relaxing or tensing on different points. It is like a yin-yang-symbol. 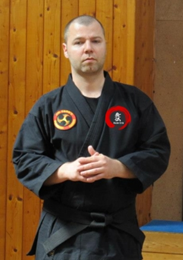 It has relaxation and tension, fast and slow and so many more principles that are used in martial art. The Triangle is one of the most solid geometrical shapes. But it points out also the weakest areas in hitting, locking, stances, moving and so on. So for the martial art you have to learn to apply the triangular postures to have the most solid structure together with triangular moving to become stronger. To make your Uke weaker you have to learn to point out the triangles on the body or on the ground to let your Uke fall in the weakest point of his stances. For me it is a refinement of the square and circle because every time when you do your movement right you create triangles. This picture should only help you to find the optimal ankle where the kinetic force should go. These core principles are important for everything what you want to do. Also if you work with Vital Points (Kyusho Jutsu) you need that to get it to work. So focusing only on points without looking at body mechanics or without teaching it is only a small part of the art. This also counts for every other art you learn.